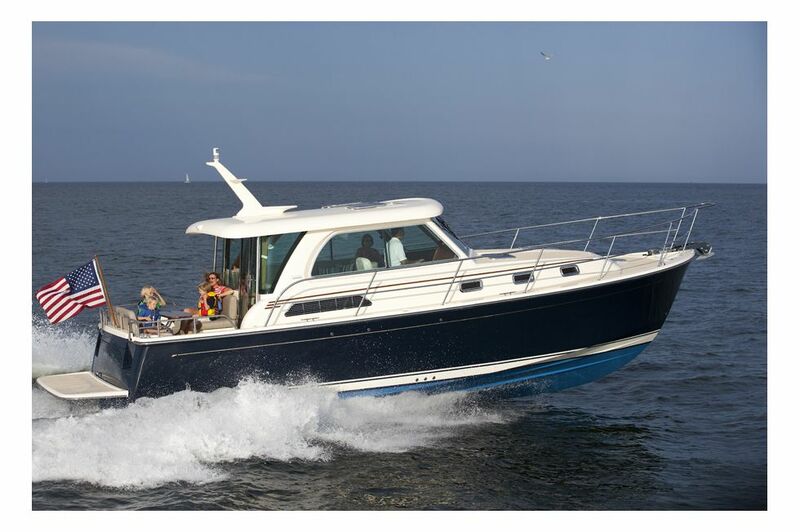 The Sabre 38 Salon Express represents the latest in design and naval architecture. 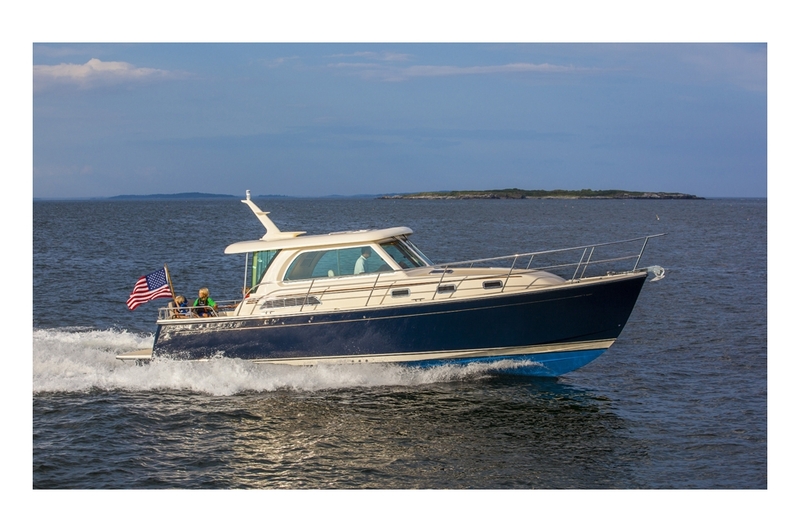 Her exterior profile says “downeast” and she is built in the tradition of Maine boat building: elegant, strong, steady, reliable and seaworthy. Below her skin, technology is everywhere: from her resin infused laminates, to state of the art systems, to her pod propulsion drive train. 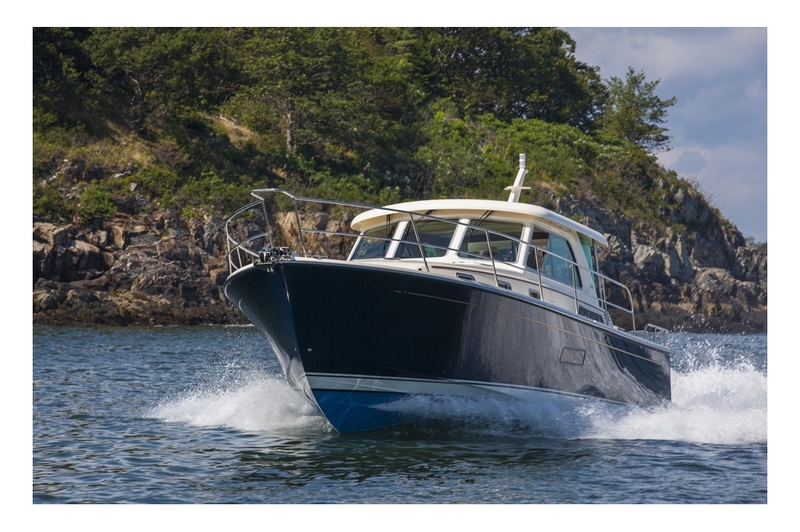 Her hull lines are the latest thinking in vee-hulled motor yachts and are specifically designed for the installation of pods, offering increased fuel economy, quiet running and a pleasant dry ride. Pods lower noise by pushing out exhaust through the propeller stream and perhaps most importantly, allow confident boat handling when docking or maneuvering in tight spaces. 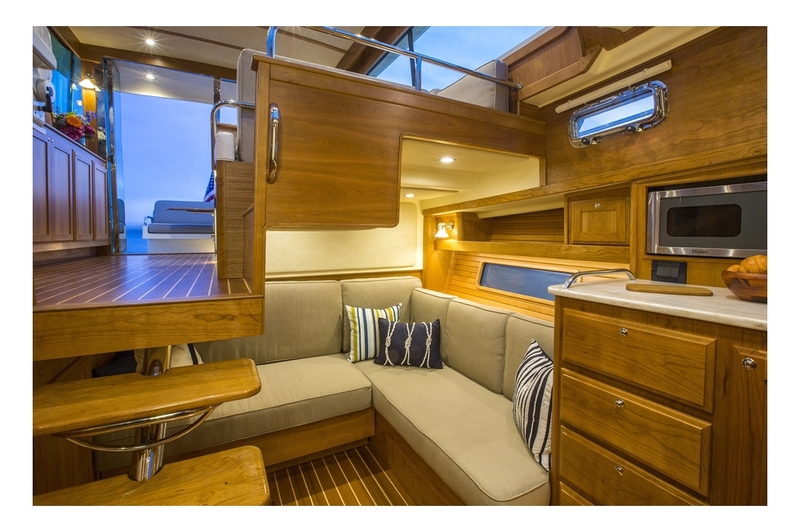 The interior of the Sabre 38 Salon Express is an open design which suits a day’s outing with friends as easily as it does a longer cruise. Her cockpit is raised to a level just 5 inches below the main salon so as to connect these two important social spaces, and the aft end of the house opens with a drop down window and a swing door. In her main salon, a raised, U-shaped settee with fixed table comfortably seats six. 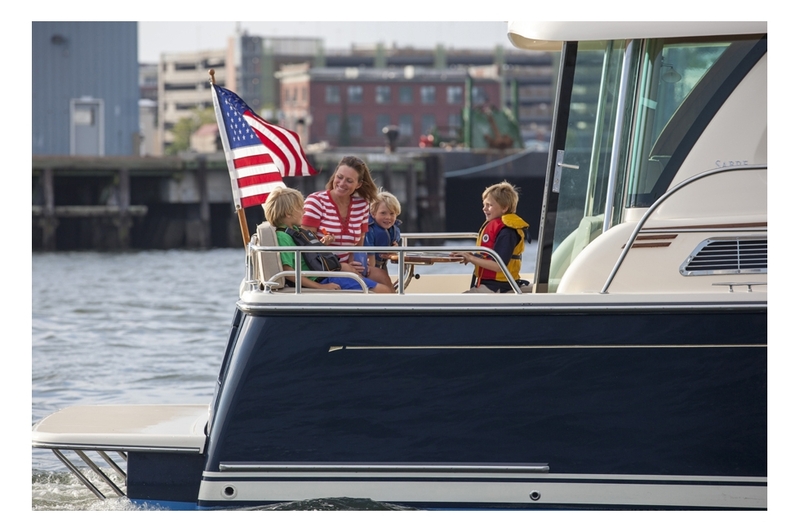 The forward end of the settee can be oriented forward to provide a comfortable mate’s seat when underway. 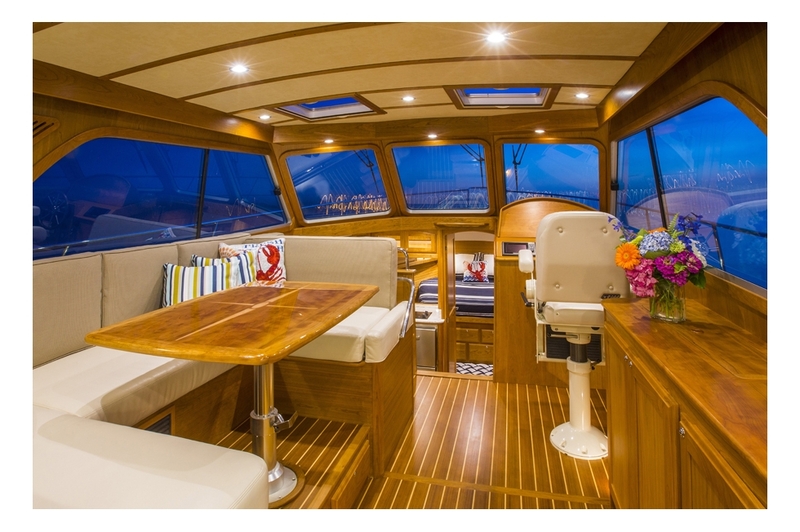 To starboard, aft of the standard Stidd helm seat, is a long cabinet housing an LED television and extensive storage compartments for the owner’s gear. 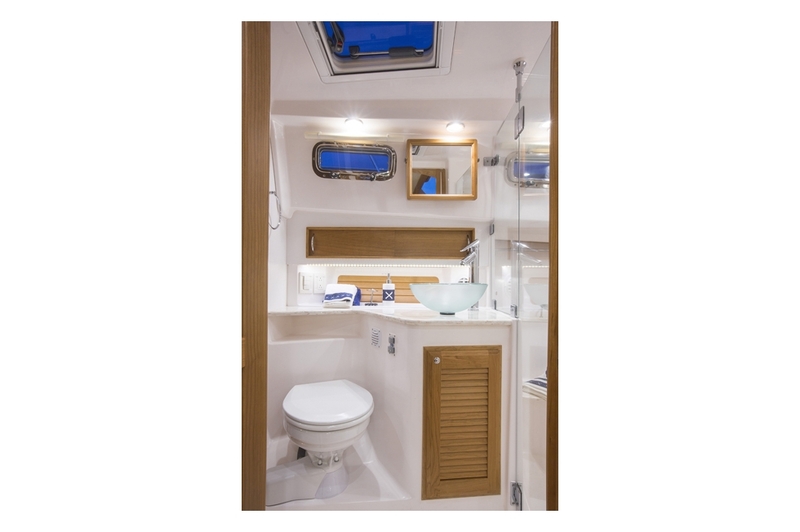 On the lower level are a master stateroom with island berth and an en-suite head with shower. 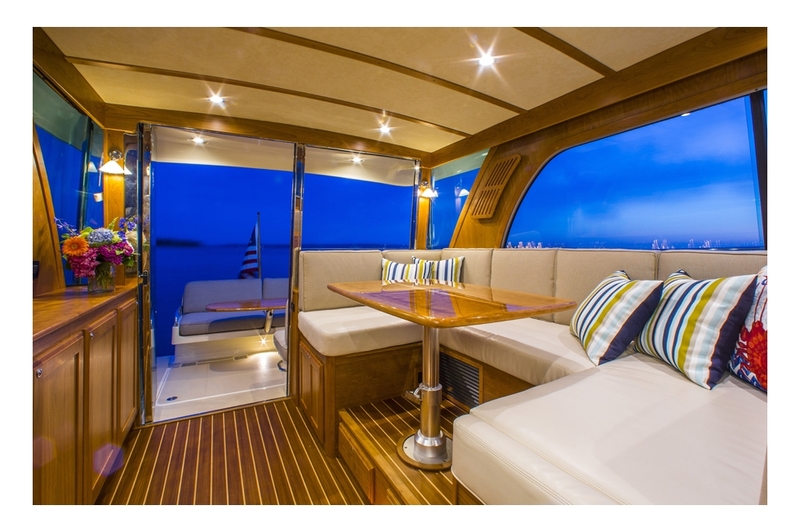 A functional galley is located to port and within easy reach and sight of the main salon. 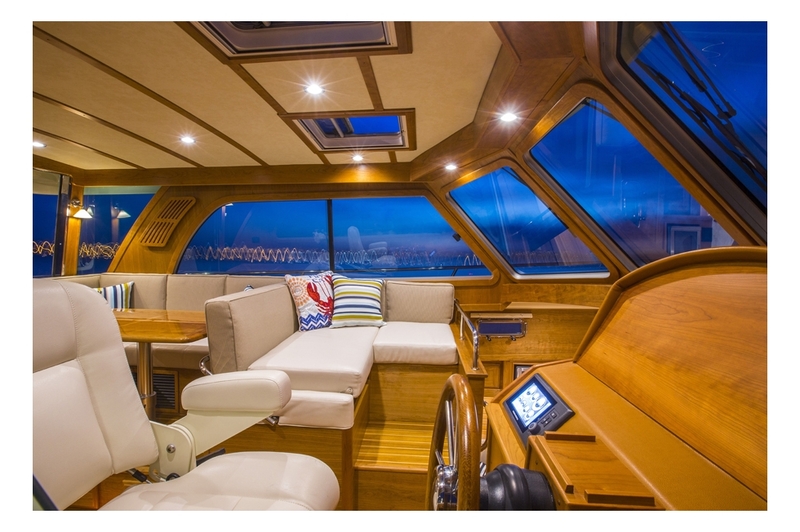 Below the helm deck, to port, is the lower lounge which can also convert to a second sleeping accommodation. The master stateroom offers the comfort of a queen-sized island berth and an en suite head compartment. 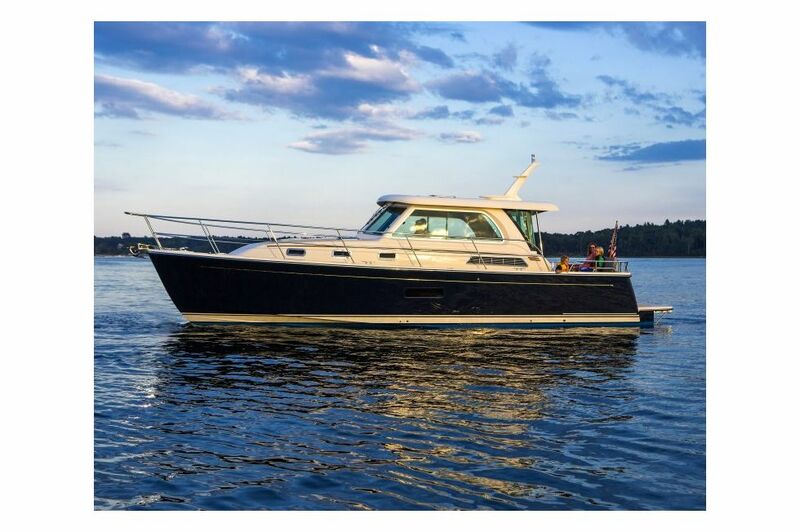 Welcome aboard the Sabre 38 Salon Express. Twin 150 USG roto-molded diesel fuel tanks. Two 4D 210 Amp hour deep cycle ship’s service batteries. 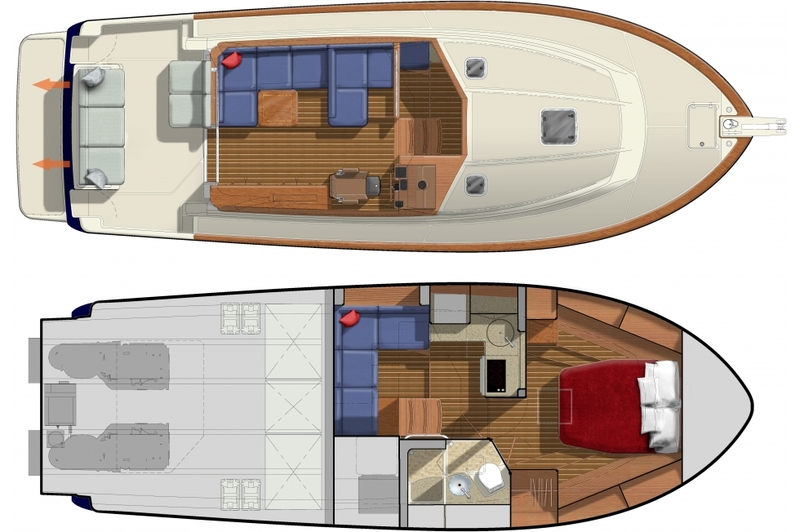 “Vee”hull design with 24 degree deadrise amidships and 17 degrees at transom. VIP Resin Infused laminate with ISO NPG white gelcoat and blended vinylester back-up resin. Swim platform with molded anti skid surface and under mounted telescoping ladder. VIP resin infused, knitted Biaxial Structural E-Glass Reinforcements with balsa coring. Flagpole holder and teak flag staff. 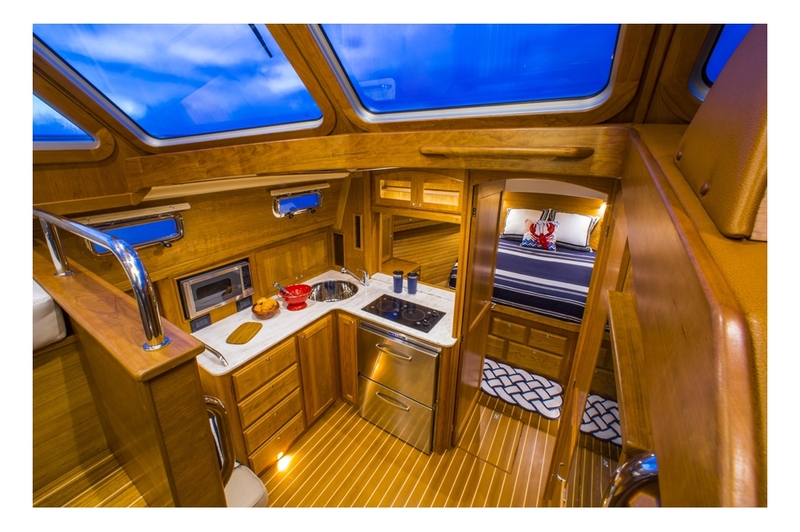 Low Profile polished hatches w/blinds and screens: (2) #44 on foredeck, (2) #10 port and starboard. Horn cleats in aft transom corners. 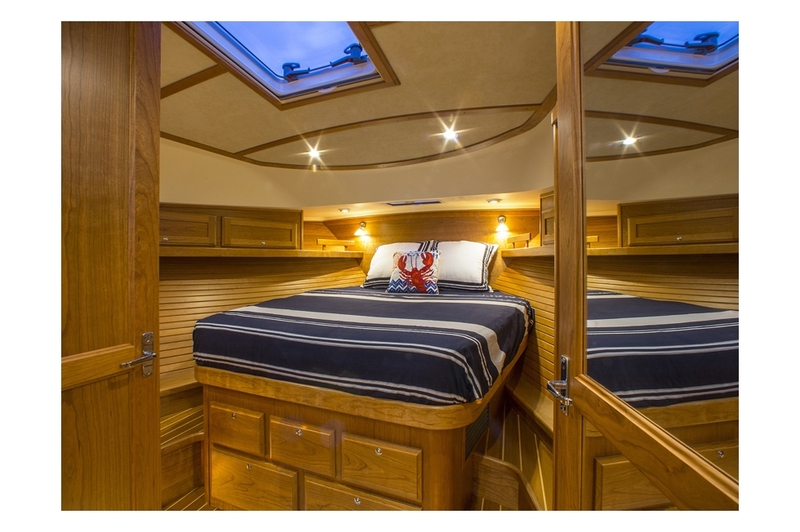 Spacious Island Berth layout with 6″ mattress. 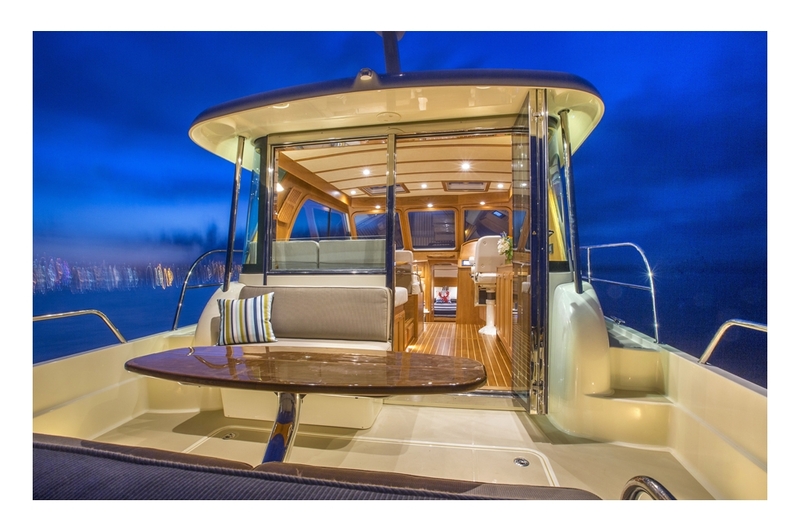 ¾” laminated trim around berth top. Drawers in bureau w/locker, shelf above w/single louvered door. Upper enclosed storage lockers with shelves. Locker face with 2 doors. Each door to access partitioned space with open shelves in the forward compartments. Large hanging locker to starboard, cedar lined with shelf and hanger pole. Open shelf above louvered door. Divider between galley and stateroom with surface mounted 26” LED Television on electric lift. Elevated “U” settee to port with Hi-gloss table with storage under. Mates L-shaped settee forward, open to galley with stainless steel hand rail. Cabinet to starboard with storage and 32” LED TV on electric lift. Option to convert settee and table into an additional berth. Stainless steel convection microwave oven. Extra large drawer handy to Galley for large items. 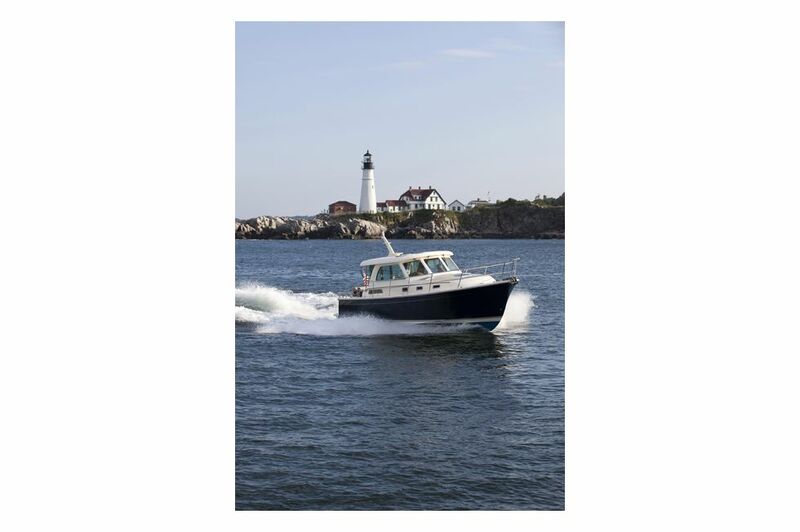 Optional large 36” x 10” Hull Side fixed portlight. Optional Television/DVD combo for lower lounge. Automatic 12V electric bilge pumps (3). High Water Alarms (3) for bilge.